Graveyards fascinate me. There’s something about wandering around old tombstones in tall grass that fires up my imagination. I’m always thinking that so many hopes, so much love, so many stories lay buried beneath them. Helen Chappell’s book, Chesapeake Book of the Dead: Tombstones, Epitaphs, Histories, Reflections, and Oddments of the Region feeds our fascination with graveyards and ghosts, and gives the reader tools for sharpening the imagination. Helen is a gifted story teller. 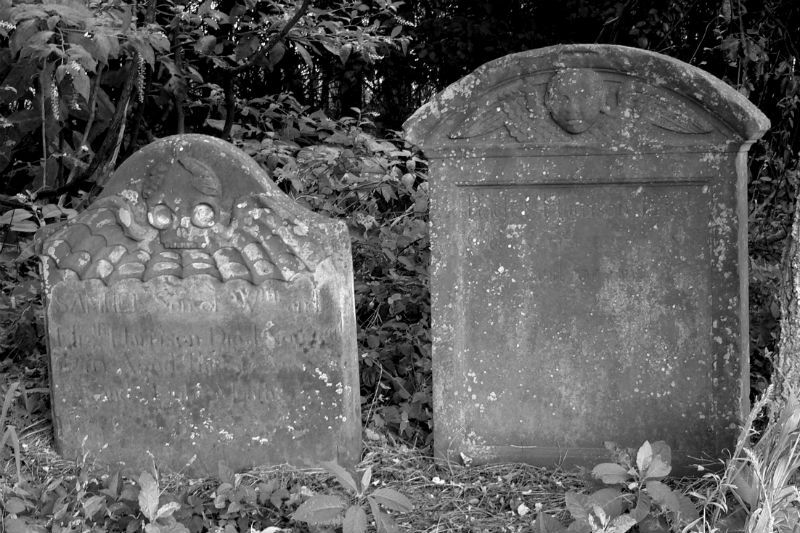 And Stark Jett’s black and white photos of Chesapeake graves are a perfect complement to Helen’s stories, historical accounts and candid style. This is a perfect book to pull out every Halloween. This hardcover book published back in 1999 by The Johns Hopkins University Press, is full of stories about the famous, infamous and interesting people who are buried in graveyards across the Chesapeake region. Tallulah Bankhead, F. Scott Fitzgerald (and Zelda), J. Edgar Hoover and John Philip Sousa are all buried in Chesapeake country . There are also stories of obscure, lesser-known characters like Hannah Manaydier, who was buried alive in Talbot County and awoke when grave robbers tried to cut off her finger to steal her ruby ring. The book also contains entertaining oral commentaries that recount the area history and ghost lore, as well as a fabulous collection of epitaphs. There is an interesting chapter entitled Death and the Doctor that shows some of the daily recordings of Dr. George S. Dare from 1877-1878. Dr. Dare lived in Rising Sun and kept records of his patient’s name, town, age, date of death, diagnosis and other related facts. The entries extracted for this chapter included five children who died from dysentery, cholera and pertussis; a 38 year old man who died from tuberculosis, whom the doctor indicated had been sick for years ; and a man who had been killed by railroad cars. The most intriguing part of Chesapeake Book of the Dead for me was the general information on death and burial traditions. The chapter entitled Customary Woe reveals some of the mourning customs of the Colonial settlers, and a look at how they viewed life and death. For those who survived childhood, death was the order of the day in an age of war, pervasive capital punishment, religious strife, epidemics, primitive medicine, ignorance and filth. Ms. Chappell moves from the Colonial traditions through the Victorian and Romantic ages describing shroud fashions, mourning jewelry made using the deceased’s hair, and bestowing the same Christian name on successive infants until one survived to adulthood. Those traditions expand into graveyard design. Women died with greater frequency than men due to the risks of childbirth, infection and fever. Men were quick to remarry. It was customary for a man to have all wives lined up in graves next to his. The most memorable part of the book for me was the chapter Batwings. Helen Chappell recounts the story of the lost City of Dover and the old Harrison cemetery nearby that had a headstone with bat wings carved into it. In the 18th century it was common for headstones to have a skull flanked with angel wings symbolizing death and resurrection. But the Harrison headstone has a skull – not with the feathery angel wings – but with the wings of a bat, with all the spiny separations. It was the Batwings chapter that moved me to go find the Harrison grave and see the bat wings for myself. I finally located a Talbot County historian who showed me the way. It was amazing. I included the Lost City of Dover and a photo of the Batwings headstone in my book Haunted Eastern Shore. Since then I have unsuccessfully sought other instances of headstones with bat wings from New England to Savannah. I even interviewed a cemetery anthropologist (if you can believe that) who wrote a book about the art of European and American headstones and their meaning. He had never heard of bat wings. So this book gets you wondering. I figure if a book moves me to actually do something, it’s a pretty good book. The Chesapeake Book of the Dead moved me to collect my first ghost story, and I’ve been collecting ever since. I highly recommend the book. It’s a great read for this time of year, and makes a beautiful gift with its hard cover and dust jacket. It’s an essential book for all who have a Chesapeake section in their home libraries. … obscure, everyday, mundane lives and deaths are literally under our feet in Chesapeake country; our lives are built on their bones. As you meet them here, greet them gently. They are waiting for us . Thanks for the correction, Lee. So far… no signs of her in my haunted world. Ive seen batwings…but I am a graveyrd. fan…what do you think they mean? We just don’t know William. I’ve inquired many times and have several reference books on tombstone art and the meaning behind some of the images. Angel wings are easy. Skeletons and skulls – easy. But so far no specific information on bat wings, only a slim cluster of people who are hazarding a guess.